Record says "from Alaska" but research reveals from Nebraska. 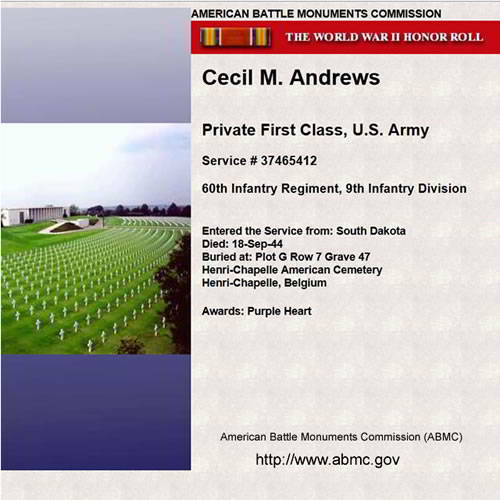 Cecil Melvin Andrews was born on December 25, 1916, in Bloomfield, Nebraska, to Burt C. and Lottie L. Andrews. Cecil had six brothers; Lyle, Lester, Curtis, Burt, Dean, and Gene, and two sisters; Fern and Loris. Cecil attended schools in Nebraska and South Dakota, as the family moved to Hill City. Cecil liked to fish and enjoyed sports. He worked in the woods, on the railroad, in mining and at Mt. Rushmore. Cecil attended church every week.